Again sponsored by Laborers' Union Local 169 and Culinary Union Local 226, this year's event will take place from 3:00 to 5:00 p.m. on March 31, 2006, at the Neil Road Community Center in southeast Reno. Washoe County School District students will fabricate signs and march from Pine Middle School to the center to begin the celebration. The public is welcome at the no-charge event which will again feature food, scholarship winners and entertainment  even a DVD produced by Pine students about the school's César Chávez mural. Click here for complete 2006 details. See you there! On March 10, 1968, Robert Kennedy and César Chávez met in Delano, California, for the breaking of Chavez's anti-violence fast. Chávez's physicians had contacted Kennedy to ask for his help in convincing Chávez to end his fast before it did more damage to his health. César Chávez, iconic civil rights leader of the 1960s, spent much of his youth in San Jose. At the time, the neighborhood was called Sal Si Puedes  "Get Out If You Can." It was in San Jose that Chávez honed the community organizing skills that served him well in launching the United Farm Workers union and leading the famous grape boycotts of the 1960s. Earlier this year, the city of San Jose dedicated a new street sign at San Antonio Street and Scharff Avenue, pointing visitors to the site of the Chávez home. If you walk by 53 Scharff Ave., you will find a squat, brown stucco duplex now sitting on the spot where young César spent his formative years. A bronze plaque on the site reads: "César Estrada Chávez Family Home." That's not exactly correct. The original house doesn't exist anymore, but the marker  and the directional sign  are proof of the entire city's pride in the fact that San Jose played an important role in the life of Chávez. VETERANS  Left to right, Maria Zamora, Librado "Lee" Chávez and Tony Mayorga. 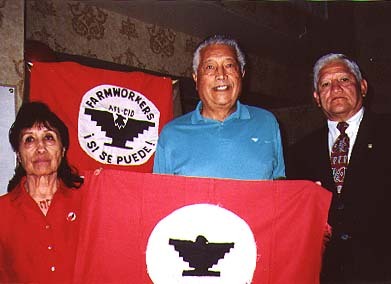 Lee Chávez holds up a United Farm Workers of America flag signed by his late brother. The flag is part of Ms. Zamora's collection of Chávez/UFWA memorabilia which she displayed at the 2004 Chávez Celebration and will do so again this year. Ms. Zamora marched with César Chávez in the 1960's and cooked for the multitudes as they trekked across California. Tony Mayorga is President of Laborers' Union Local 169, a founding sponsor of the celebration. Northern Nevada will mark its fourth César Chávez Day celebration on Thursday, March 31, 2005, which would have been the soft spoken leaders 78th birthday. Pappas Telecasting of Nevada, which owns stations KREN TV-27 (Charter Cable Channel 6), a WB affiliate, and KAZR TV-46 (Charter Cable Channel 24), an Azteca America affiliate, celebrates César Estrada Chávez with an essay contest and a special presentation. The region's first César Chávez Day was declared by the Reno City Council in honor of Chávezs visit on July 15, 1986. The Pappas Telecasting stations began the annual commemoration in 2003. Last year's event drew twice the attendance of 2003. The public is invited to the event in the Reno Hilton's Crystal Ballroom. Doors open at 5:30 p.m. on March 31, with the program beginning at 6:00 p.m. Nevadans who knew or worked with Chávez will speak on their experiences. Members of his immediate family are again expected to attend. There is no charge for admission, however anyone wishing to attend please RSVP with KAZR and KREN at 775-333-2727 before Friday, March 25. In conjunction with the Washoe County School District, students in three grade levels are again participating in an essay contest. The competition is open to all students from Kindergarten through 12th grade. Winners will read their variations on this year's theme, "How have César Chávez, his work or his ideas affected my life?" In late March and early April, KAZR TV-46 and KREN TV-27 will air special vignettes honoring César Chávez. KAZR TV-46 will premiere a new half-hour César Chávez documentary on the day of the celebration. It will air at 6:30 p.m. with repeats at 11:30 p.m. on March 31 and at 1:30 a.m. on April 1. César Chávez was born on March 31, 1927, on a small farm near Yuma, Arizona. At 10 years of age, Chávez began life as a migrant farm worker. This ultimately led to his cause or "La Causa," advocating for better wages and working conditions for the nation's farm workers. In 1952, he began the National Farm Workers Association (NFWA) to strive for equal rights for agricultural workers. Renos WB broadcast television network focuses on Renos younger demographic with top quality family programming. Azteca America broadcast television network focuses on the rapidly-growing Reno Hispanic population. Renos affiliate produces the only Spanish language newscast in Northern Nevada. Reno, Nevada  El Norte de Nevada conmemorara el cuarto Día de César Chávez este Jueves, Marzo 31, el cual seria su cumpleaños numero 78 del desaparecido líder agrícola. Pappas Telecasting de Nevada, quienes son propietarios de las estaciones KREN 27 afiliada de WB y KAZR 46 afiliada de Azteca América a la vez, conmemorarán a César Estrada Chávez con un concurso literario y un programa especial. El primer Día de César Chávez fue declarado por el Consejo Municipal de la ciudad de Reno en honor a la visita de Chávez en Julio 15, 1986. Las estaciones de Pappas Telecasting empezaron las celebraciones anuales de conmemoración en el 2003. El año pasado este evento duplico la concurrencia del año anterior. El publico en general esta invitado al evento que se realizará en el Reno Hilton - Crystal Ballroom. Las puertas del evento abrirán a las 5:30 p.m., Marzo 31. Iniciándose el programa a las 6:00 p.m. Los nevadenses que llegaron a conocer y trabajaron con Chávez nos expondrán sus experiencias. Miembros de la familia Chávez se espera atenderán el evento. La admisión es gratis, sin embargo cualquiera que desee asistir puede hacer sus reservaciones con KAZR y KREN al teléfono 775-333-2727 antes del Viernes, Marzo 25. En conjunción con el distrito Escolar de Washoe County, escolares de los tres diferentes niveles estarán participando nuevamente en el concurso literario. El concurso esta abierto a todos los estudiantes desde Kindergarten hasta el 12th grado. Los ganadores leerán sus composiciones basados en el tema de este año: "Como es que la trayectoria e ideas de César Chávez han afectado mi vida?" KAZR TV 46 y KREN TV 27 estarán difundiendo durante el fin de Marzo y comienzos de Abril cortos especiales honrando a César Chávez. KAZR TV-46 estará estrenando un documental de media hora sobre Cesar Chávez el día central de la conmemoración. Este especial estará al aire a las 6:30 p.m. con repeticiones a las 11:30 p.m. el 31 de Marzo y a las 1:30 a.m. el 1 de Abril. César Chávez nació el 31 de Marzo de 1927, en una granja cerca a Yuma, Arizona. A los 10 años de edad, Chávez empezó su vida como "brasero" junto a su familia. Este hecho en su vida provoco que Chávez se convirtiera en un abanderado por la justicia social, a la cual el llamo "La Causa", propugnando mejoras salariales y mejores condiciones de trabajo para los trabajadores en los campos de cultivo. En 1952, el constituyó la Asociación Nacional de los Trabajadores del Campo- Nacional Farm Workers Association (NFWA) con el fin de defender la igualdad de derechos para los trabajadores agrícolas. César Chávez aprendió y practico los principios de No Violencia del Dr. Martín Luther King Jr. y Mahatma Gandhi. Chávez falleció el 23 de Abril de 1993, a la edad de 66 años. El fue honrado póstumamente con la Medalla Presidencial de la Libertad en 1994 por el presidente Bill Clinton. Además, el servicio postal imprimió una estampilla conmemorativa de primera clase con su imagen en el 2003. Reno celebrará "Día de César Chávez"
The Nevada Alliance for Workers' Rights will re-air a half-hour special entitled "Chávez Lives in You" on SNCAT/Charter Cable 16 in Reno-Sparks. The late AWR Executive Director Tom Stoneburner's guests are Gilbert Cortez, who played César Chávez at the March 31, 2004, Chávez event, and Francisco Granados, Culinary Workers Union Local 226 shop steward who worked with Chávez all over California. Dates/Times: Sunday, March 27 at 8:00 p.m.; Thursday, March 31 at 8:00 p.m. & 12:00 midnight; Friday, April 1 at 8:30 p.m. and Saturday, April 2 at 11:30 a.m.